I took Peatuk out in his stroller today. 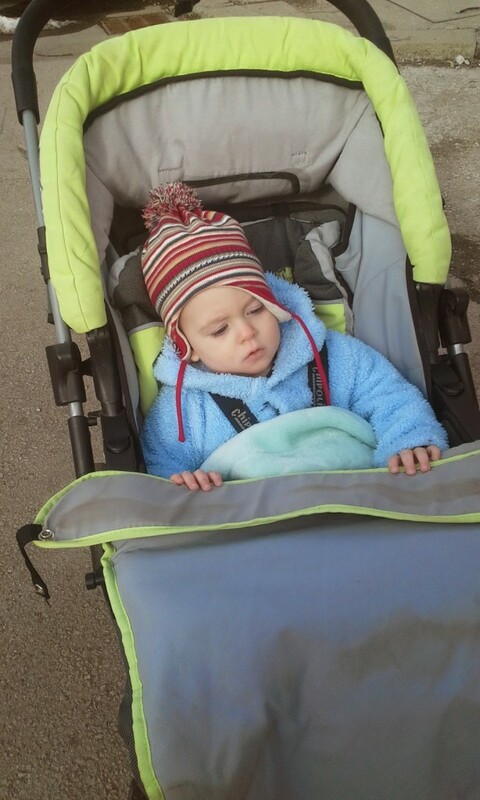 The last time we used the stroller was before we moved to Gabrovo, so it has been at least two months. Generally, Nikola and I only use the stroller when we are together and have a lot of random things to do. This was because it can be difficult to get on and off the buses in Varna, it can be a little unwieldy in general, an Peatuk usually only lasts a little while in it before he starts crying. Well, the little bug is getting heavier each day, and he has a huge desire to look at the world around him. He likes riding in the grocery carts at supermarkets, so I decided to try him in the stroller again. It was like he was a different kid altogether. Before, whenever we put him in the stroller we had to distract him with toys and cooing until we got him bucked and moving. Today, I plopped him in the stroller and he sat, perfectly content, while I arranged things for five minutes. He babbled occasionally, but spent a full hour in the stroller, going to two grocery stores, without crying. It can be difficult to manipulate- up stairs, curbs, muddy sections of paths and tight corners in grocery stores. After baby wearing for so long, I miss the freedom of going wherever I feel like without wondering if I will fit. It gets muddy. I then track that mud inside stores, my apartment building, and my home. It makes grocery shopping awkward. I have no place to put groceries, and I can’t leave the stroller at the entrance to the store to take a cart instead. Putting the groceries underneath him requires a lot of stooping that is just annoying. I think number four was the worst, and why I am hesitant to try the stroller. While Peatuk seemed perfectly happy riding along in it, I found that I missed his closeness. I am used to being able to kiss his head while we walk. I whisper in his ear. He falls asleep against my chest. It already feels like he is growing up so fast, I am not sure if I am ready to give that closeness up quite yet.